These baked chicken wings are actually fried first. Frying gives the flour coating a crispy texture. The addition of the cooking sauce brings lots of rich flavor and creates a nice glaze. Dip wings in egg, then in flour. Fry in hot oil or butter until golden brown. Lay in a baking pan. Mix all sauce ingredients together and pour over fried chicken wings. Bake covered for 15 minutes, then uncovered for 30 minutes. This chicken wing recipe is fabulous, but there is one thing you can do to make them a bit healthier. First of all, that’s a lot of sugar in the recipe, I would cut it down a bit, even to 3/4 cup. They would still taste sweet but not as much. The soy sauce, sugar and vinegar combination is a great mix of tang and sweetness without being overpowering. This chicken wing recipe is really easy to cook and makes a terrific finger food party appetizer or main dish. 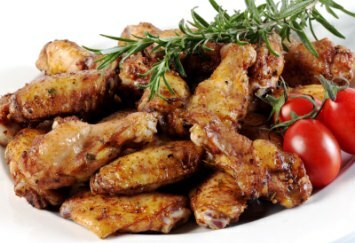 Find more great chicken recipes like our baked chicken wings, here.